Learn about the interesting objects in the constellation of Orion. Weather permitting there will be the opportunity to drop by and view the Moon through Caithness Astronomy Group telescopes at Thurso Riverside and Wick High School on the evening of Saturday 16th February. 7.00 - 8.00pm. 20 - 20 Vision "The Future of Astronomical Telescopes"
The public astronomy talk is by regular CAG visitor Professor Martin Hendry MBE - his talk is part of the series of local IYL events that have been held this year. Martin will also be visiting a couple of Wick schools whilst in the area, to enthuse interest in space and science in . 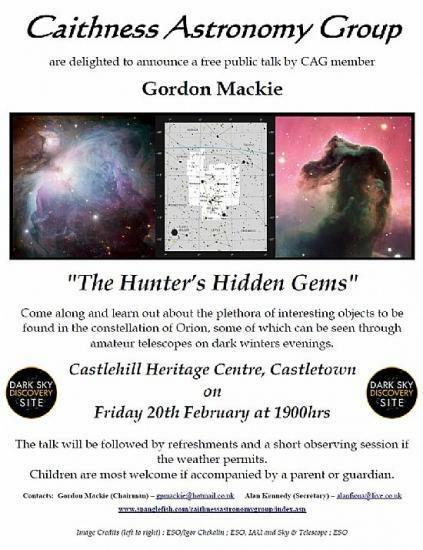 Observing and Imaging Eclipses Friday 13th March, Castlehill Heritage Centre at 7pm Talk by CAG, with demonstrations that will provide useful guidance prior to the significant solar eclipse on 20th March. Followed by an after dark observing session if weather permits. Friday 31st October, --- Caithness Astronomy Group talk and observation evening. "An Even Briefer History of Time". Join CAG and guest speaker Dr Lyndsay Fletcher, a Solar Physicist based at the University of Glasgow for a weekend of events where you can: Learn about the Sun & how it generates "weather" in space that affects our planet. Find out how this stormy space weather can produce the magnificent diplays of Northern Lights we often see from Caithness. Public and Schools Solar Observing Activities 2012 During the International Year of Astronomy, Caithness Astronomy Group held numerous public and school events, engaging the local population with the varied science and technology associated with Space and Astronomy. Thanks to funding from the IoP in Scotland and the Dounreay Communities Fund in 2010, Caithness Astronomy Group (CAG) were able to purchase solar observing equipment that provided a new avenue for engaging with the local population that would complement our night time observing events.